The standard tenor ukulele tuning is G, C, E, A, which is identical to the soprano and concert ukuleles. This standard tuning is also known as “C” tuning, probably because, when using reentrant tuning, the lowest pitch across all the strings is C.
However, to complicate things slightly, the tenor has two common variations of G, C, E, A, known as High-G and Low-G.
One element of the unique ukulele sound is created through its tuning. The High-G variation uses reentrant tuning – this means the strings are not tuned in high to low order. 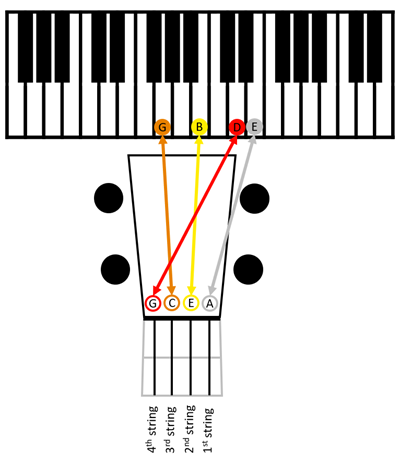 The specific tuning notes are G4, C4, E4, A4; the open G note of the 4th string is a higher pitch than both the 3rd and 2nd string, but one tone lower than the 1st string. 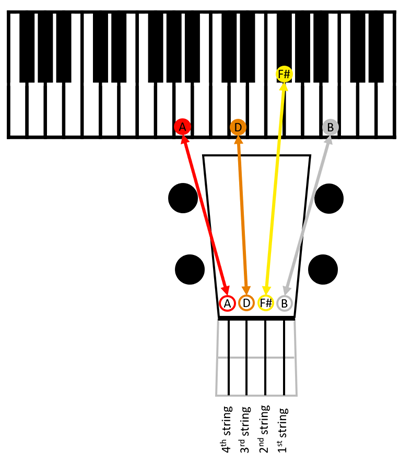 The image below shows how the notes compare to a piano keyboard. The Low-G variation tunes the 4th string an octave lower, making it the lowest pitch on the instrument. The tuning notes are G3, C4, E4, A4, giving a wider melodic range. Though, the lack of reentrant tuning does take away some of the traditional ukulele sound. The image below shows how the notes compare to a piano keyboard. The two images show the key distinction between reentrant and linear tuning. Most modern ukulele music, lessons and training materials are set for G, C, E, A tuning, which means for chords, it doesn’t matter which tuning you use. However, when needing to be specific about individual notes, such as playing scales and solos, care needs to be taken as the notes on the 4th string are not the same. You will need different strings for High-G and Low-G tunings. The 3rd, 2nd and 1st strings will be the same, but the 4th will be different. Low-G tuning requires a much thicker 4th string. D-tuning was very popular in the 1920s-1930s and much of the older sheet music from mainland USA is set in this tuning. The school system in Canada used ukulele’s extensively in musical education. A, D, F#, B was commonly used at the time, so it is often referred to as Canadian tuning. The tuning notes are one tone (two frets) higher than standard tuning using A4, D4, F#4, B4. 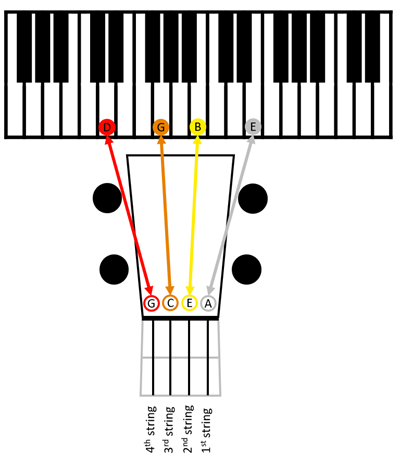 There is also a Low-A variation, known as English Tuning, which is A3, D4, F#4, B4. 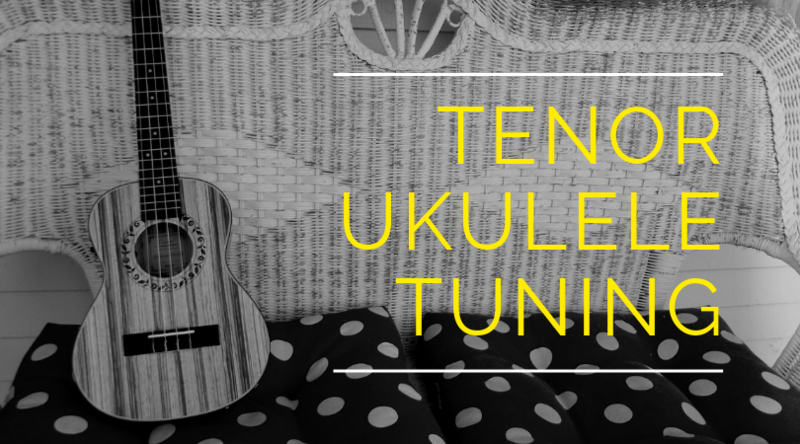 G-tuning is commonly used on the baritone ukulele, but that doesn’t mean you can’t give it a go on a tenor, it’s just a matter of getting the right strings. 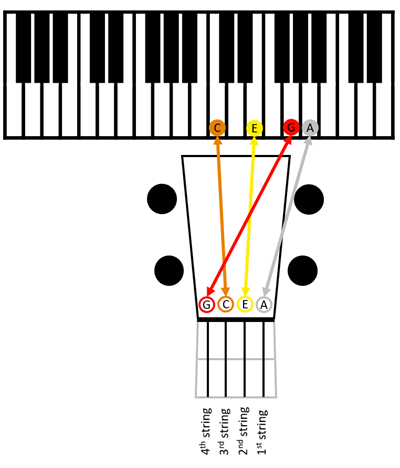 The tuning notes are D, G, B, E, which are the same as the top 4 strings on a guitar, making it an ideal transition instrument for guitarists wanting to play a ukulele. No matter which tuning you are using, being able to tune the strings to the right pitches is very important. If you’re playing on your own, it’s OK for the tenor to be in tune with itself. But, if you are playing with others, then you also need to be in tune with them. The easiest method to tune a tenor is to use an electronic tuner. The tuner will show the pitch whether if you are too flat or too sharp. These are great for beginners, as tuning by ear can be tough at the start. I recommend the following tuner. To tune a ukulele to itself, you do not need an electric tuner. Reentrant tuning does make things more complicated (and harder to remember). The tuning method uses the 4th string as the start tone. 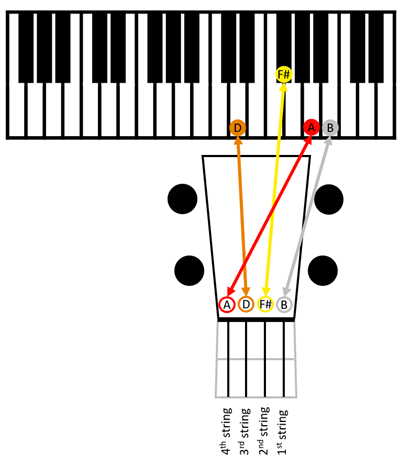 C Tuning Low-G, and G Tuning Low-D is much easier to understand and remember. The tuning method uses the 4th string as the start tone.